Risk assessment is a multi-step process which, in conjunction with an exposure assessment and other components, produces estimates of risk of an adverse health effect occuring as a consequence of ingesting, inhaling and/or absorbing one or more toxic substances. TCAS has produced many risk assessments over a period of more than 28 years (additional information can be found in our case studies). In an exposure scenario, the expert toxicologist's role is primarily to address "baseline risk." The illustration at right outlines the components of a baseline risk assessment. This is an analysis of potential adverse health effects (current or future) caused by the release of a toxic substance prior to remediation. Aside from providing a scientifically credible projection of risks to human health, the baseline risk assessment also contributes to the site characterization and assists decision-makers in determining whether there is a need for remediation. It can also play an important role in future property development plans which can be important considerations in matters of litigation. Data collection and evaluation is the process of gathering and analyzing site data. It may also involve compilation of geophysical data and historical information relevant to the release of toxic agent(s). The expert toxicologist must identify the substances of potential significance present at the site, as these will be the focus of the risk assessment process. An exposure assessment estimates the magnitude, frequency and duration of human exposures. It also defines the pathways by which humans are potentially exposed. The results of an exposure assessment are a set of pathway-specific doses (or inhalation levels) for current and future exposures to the substance(s) at issue. The expert toxicologist must also develop reasonable estimates of exposure (dose) with respect to current and future land-use assumptions. These estimates can play an important role in determining whether a threat still exists. They can also assist decision-makers with respect to assessing the potential for future exposures and whether or not remediation is indicated. 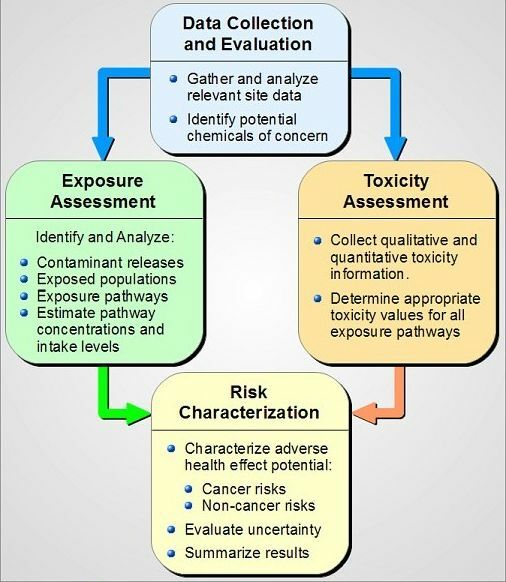 A toxicity assessment addresses (a) the adverse health effects associated with exposure, (b) the relationship between magnitude of exposure and adverse health effects and (c) uncertainties such as the weight-of-evidence (WOE) of a chemical's carcinogenicity in humans. This is frequently a two-step process consisting of (1) hazard identification and (2) dose-response evaluation. Hazard identification essentially consists of research based on chemical-specific toxicity studies and the prevailing body of generally-recognized, peer-reviewed literature. The expert toxicologist assesses the nature and strength of causative evidence to determine if a particular substance is capable of causing specific adverse health effects. The dose-response evaluation quantitatively evaluates the toxicity relationship between dose and incidence of adverse health effects. From this the expert toxicologist derives toxicity values which are subsequently used to assess the potential incidence of adverse health effects at different exposure levels. Risk characterization combines and summarizes the exposure and toxicity assessments to produce baseline risk estimates. To produce a reliable baseline risk assessment, the toxicologist must essentially compile a concise history of toxic release events and exposures from a toxicological perspective. Typically, the expert toxicologist presents his findings in both quantitative and qualitative statements in the form of a written report. The report must disclose all findings and, in particular, must credibly compare chemical-specific toxicity data against measured contaminant exposure dose levels and exposure duration. The report also must estimate risk based on fate and transport modeling to determine whether current and future exposure levels may be of potential concern (based on the prevailing land-use assumptions). A "methodology" (or unified set of methods) provides principles, rules and guidance for producing results consistent with the application of specific investigative procedures. It is important to keep in mind that the primary focus of a toxicological risk assessment is human health. In keeping with this mandate, the expert toxicologist must apply a specific set of methods to conduct a reliable risk assessment. The U.S. EPA publishes in-depth risk assessment guidance1 and this methodology serves as the procedural basis for most risk assessments in the U.S. Procedural guidance is extremely useful in an evidential investigation. However, objective scientific judgment also plays an important role. Only by strict attention to detail can scientifically credible findings be produced. All toxicological conclusions must meet the criteria for reasonable toxicological certainty. Thus, in the course of producing a credible risk assessment, a number of potentially pivotal issues may arise which, if not addressed in accordance with the generally-accepted methodology, could lead to a report being challenged. The following paragraphs summarize some of these issues. The spirit of any risk assessment is to completely and factually provide full disclosure of all relevant factors in a contamination scenario by applying generally-accepted, peer-reviewed methods. Thus, selection of assessment method is just as important as carrying out the analysis itself. The choice of method has the potential not only to impact the results of a risk assessment but can also impact the scientific credibility of the report. The expert toxicologist must, therefore, ensure that all assessment methods are appropriate and consistent with the objectives of accuracy and reliability. For example, in most site-specific assessments, it is critically important to identify and delineate locations which still contain residual contamination. These are typically designated as Areas of Concern (AOCs). Within each AOC, there may be several Areas of Investigation (AOIs) which delineate areas containing known contaminant concentrations. Areas of Concern (AOCs) are regions in which contaminants have been released to the environment or a waste management unit. When one or more chemicals are released into the environment, a responsible assessment must do more than report average contamination levels spread over a broad region. The assessment must also establish the boundaries of impacted areas (typically delineated horizontally and vertically). 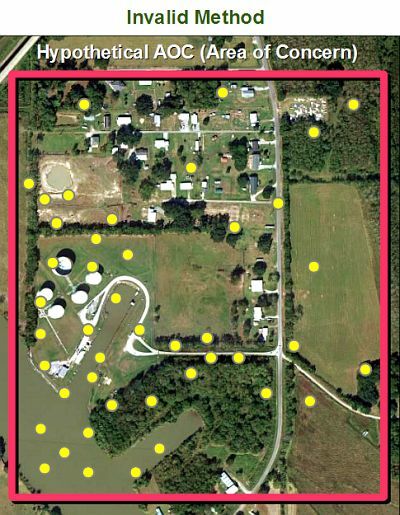 Since contamination can impact future land use and the surrounding community, successful remediation relies on correctly identifying contaminated areas and addressing them in compliance with regulatory guidance. 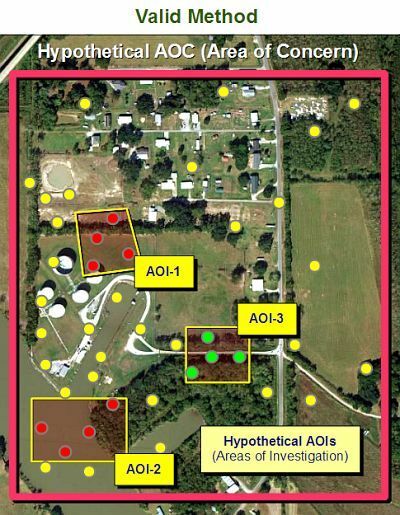 Areas of Investigation (AOIs) represent zones within an Area of Concern (AOC) in which measured chemical concentrations (through sampling or monitoring) can be shown to exceed regulatory standards. Areas of investigation are important because they identify and isolate specific chemical concentrations. This has a relevant bearing on risk assessment. Failing to identify AOIs in the exposure region can lead to erroneous and misleading results. In the illustrations below (from an actual TCAS case), samples were taken in a residential area to determine the extent of contamination. In the first example, areas of investigation were defined and the results compiled in a manner consistent with the spirit of the risk assessment; i.e. a calculation of the 95% UCL-AM (95 percent upper confidence limit of the arithmetic mean). This allows for correlation with cancer risk, slope factors, hazard index and regulatory standards. This calculation is performed for each substance in every AOI in which substance concentrations exceed regulatory levels. This is a valid method because it is in every way consistent with prevailing Federal and State risk assessment guidance (i.e. U.S. EPA, RAGS, RECAP, etc.). In the second example, no individual areas of investigation (AOIs) were defined. The assessment merely averaged all of the samples together. Diluted averages present an unreliable assessment of localized concentrations. The underlying assumption that diluted averages quantitatively represent AOIs under consideration for remediation is erroneous. This approach invariably produces misleading results and is valid only in cases where no regulatory exceedances are present in the sample data. Cancer risk determinations are a key part of risk characterization. U.S. EPA publishes detailed "Guidelines for Carcinogen Risk Assessment. "2 However, the expert toxicologist must also consider additional guidance documents and utilize the most recently-available information on target organ effects when assessing cancer risks. New guidance is continually being published as new peer-reviewed studies become part of the ever-growing body of toxicological literature. The expert toxicologist should always address such guidance to ensure that information from studies on carcinogenesis and other health effects are considered together in the overall characterization of risk. The expert toxicologist must be consistent in presenting cancer risk conclusions. Cancer slope factors convert estimated daily intakes averaged over a lifetime of exposure directly to an incremental risk of a person developing cancer. As a general rule, average lifetime exposures should be used while all less-than-lifetime exposures should be converted to equivalent lifetime values. Similarly, if a toxicity value is based on average lifetime exposure (e.g., slope factors), then the exposure duration should be expressed in the same manner. Thus, it is important to remember that the variables in both the exposure assessment and the toxicity assessment should all be based on the same underlying set of conversion factors. Although the approach for estimating carcinogenic risk is based on the assumption that a high dose received over a short period of time is equivalent to a corresponding low dose spread over a lifetime, this approach becomes problematic as the exposures in question become more intense but less frequent. This is especially true for confirmed human carcinogens and/or when there is evidence that the agent has shown dose-related carcinogenic effects. Therefore, the expert toxicologist may need to assess the level of uncertainty associated with the exposure assessment for carcinogens. Both U.S. EPA and WHO3 recommend that "...the discussion of uncertainty should be included in both the exposure assessment and risk characterization chapters of the risk assessment report." For risk assessment purposes, it can generally be assumed that the dose-response relationship will be linear in the low-dose portion of the multistage model dose-response curve. U.S. EPA has stated that relatively low intakes (compared to those experienced by test animals) tend to originate mainly from environmental exposures. However, these assumptions may not hold true for all cases, particularly those involving short-term or higher-dose exposures. Regulatory guidance on these topics is continually being updated. The expert toxicologist should always review the most recent guidance before settling upon a particular method for performing cancer risk calculations. Although U.S. EPA publishes detailed information concerning "default" intake values for a wide variety of circumstances, age groups, etc., some states have legislated their own corrective action policies. Some of these policies provide specific guidelines for exposure intake levels. For example, a person living in a coastal region may consume greater quantities of shellfish than a person living in a land-locked state. In such cases, certain "default" assumptions may exist with respect to intake values. These may be further qualified by land use (whether an area is classified for residential use, industrial use, etc.). In such cases, the expert toxicologist will generally apply the default assumptions unless there are compelling reasons to do otherwise. Additionally, the land use assumptions and source of intake values applied in risk calculations must always be clearly defined as these serve to codify and validate region-specific baseline risk conclusions. It is important to bring historical factors to the forefront in a risk assessment. Historical factors may have a direct and relevant bearing on remediation in a toxic release scenario particularly in cases of chronic long-term exposures. For example, if laboratory results of soil or water samples taken prior to a release are available, comparison of these samples with more recent samples may have a direct bearing on assessing risk. Such data can be used to demonstrate concentration decreases or increases over time. Such data may also subsequently prove to be evidential if applying Hill Factors in a causative investigation. Risk assessment testimony is governed by the same rules of evidence as causation and other scientific aspects of toxicology. In particular, toxicological testimony cannot be considered admissible if the evidence is based upon a "novel" scientific technique or methodology. Expert testimony must have its basis in reliable scientific techniques which are generally accepted by the relevant scientific community. The expert toxicologist's testimony must be responsive to answering the questions at issue and rest on a sound, reliable scientific foundation (Rule 702, Federal Rules of Evidence).4 Although personal observations and professional experience may contribute to formulating an opinion, they do not in themselves constitute an admissible basis for a conclusion and, if offered, must be supported by "good science." In conjunction with risk assessment, exposure assessments indicative of significant human health risks can trigger the need for medical monitoring. Medical monitoring is defined in legislation as "...periodic medical testing to screen people at significant increased risk for disease." This is a specific set of procedures5 defined by the Comprehensive Environmental Response, Compensation, and Liability Act (CERCLA) or more commonly known as "Superfund." The specific objective of Superfund is "...to clean up uncontrolled releases of specified hazardous substances." "The primary criteria for medical monitoring should be documented evidence of exposure of a population to a hazardous substance in the environment. An exposure will be considered to be at a sufficient level if there is documentation of an increased opportunity for exposure to a level that meets or exceeds some health-based comparison value, such as Minimum Risk Levels (MRLs) or Reference Doses (RfDs), or that meets or exceeds a level reported in the peer-reviewed literature to result in some adverse health effect. Documentation is considered sufficient if it is from an exposure assessment, environmental exposure modeling, or sampling from a general area (for example, water samples from an aquifer or a town water supply). Documentation of individual levels of exposure is not required. In cases in which exposures are unknown or undocumented, environmental monitoring is a more appropriate initial activity." "In areas where biological markers of exposure have not been collected, environmental sampling can be used to estimate exposure levels. The target population of concern is the population in which there is documented exposure at a sufficient level to place the individuals in that population at significant increased risk for developing some specific adverse health effect." "ATSDR's Final Criteria for Determining the Appropriateness of a Medical Monitoring Program Under CERCLA," 1995 Jul 28;60 FR 38840-44. Medical monitoring is typically directed toward a target community identified as being at "significant increased risk for disease" on the basis of its exposure. This can involve small numbers of people or tens of thousands. Significant increased risk will vary from site to site depending upon such factors as the potential magnitude of harm of the specific outcome, the risk attributable to the exposure or the presence of sensitive sub-populations. Medical monitoring can be expensive and is frequently a matter of significant concern in litigation. An experienced, objective toxicological assessment to determine if there is a bona fide need for medical monitoring in compliance with the CERCLA criteria is an absolutely essential component in environmental cases involving a community or class of individuals. A well-organized toxicological risk assessment reliably measures the likelihood of adverse human health effects from a potential toxic exposure. It can also offer guidance with respect to property remediation, disposition and future-use issues. The expert toxicologist must pragmatically research contributing and historical factors, perform the required dose and risk calculations in the proper order, professionally summarize the results and communicate written findings in a scientifically-objective manner. The benefits of an objective risk assessment produced in accordance with generally-accepted guidelines (such as those published by U.S. EPA) are many. Aside from accurately characterizing potential risk of adverse health effects, a well-constructed risk assessment can be instrumental in assisting a judge and jury when making decisions pertaining to remediation, medical monitoring, environmental monitoring, administration and other matters at issue. U.S. Environmental Protection Agency, "Risk Assessment Guidance for Superfund, Volume I, Human Health Evaluation Manual,"
World Health Organization, "Principles and Methods for the Risk Assessment of Chemicals in Food,"
Agency for Toxic Substances and Disease Registry, "ATSDR's Final Criteria for Determining the Appropriateness of a Medical Monitoring Program Under CERCLA," Federal Register, 1995 Jul 28;60 FR 38840-44. Graphical image adapted from U.S. EPA, "Risk Assessment Guidance for Superfund,"
"Risk assessment involves exacting work and attention to detail. Results must always meet the criteria for reasonable toxicological certainty. Adhering to peer-reviewed methods is the only way to ensure that results will stand up to scientific scrutiny."